Page revised in March 2016. Photos taken in 2015 with Canon Powershot SX 700 HS. They pronounce it "Pom-pay-e". I always had an idea that you went down into Pompeii with torches, by the way of damp, dark stairways, just as you do in silver mines, and traversed gloomy tunnels with lava overhead and something on either hand like dilapidated prisons gouged out of the solid earth, that faintly resembled houses. But you do nothing of the kind. Mark Twain - The Innocents Abroad - 1869. Pompeii is the oldest archaeological site in the world as the first excavations aimed at unearthing its buildings started in 1748. Most Grand Tour travellers of the XVIIIth century visited the ancient town and many of them wrote about it in letters and books. All made references to Mount Vesuvius and tried to guess how Pompeii was covered by the ashes erupted by the volcano in 79 AD. Considering the distance between Pompeii and Vesuvius (..) my own conjecture is that the stones and ashes must have remained suspended in the air for some time, like clouds, before they descended upon the unfortunate city. To picture more clearly what must have happened historically one should think of a mountain village buried in snow. J. W. Goethe - Italian Journey - March 1787 (translation by W. H. Auden and E. Mayer - Collins 1962). Pompeii lay closer to the sea than it does today and it had its own port at the mouth of a nearby river. Unlike Naples it was not founded by Greek settlers, but by the Osci, an Italian tribe, in the VIth century BC. It then became an important town of the Samnites, another Italic tribe opposing the hegemony of Rome over southern Italy. It eventually became a Roman colony in 80 BC. The beauty of the Bay of Naples led to the construction of many villas, including some by the emperors. 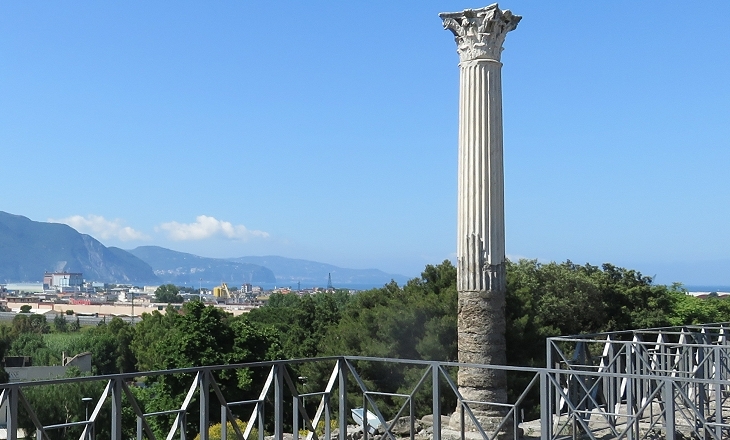 Baiae in particular, at the north-western end of the gulf, was chosen for its position on the sea (Emperor Hadrian died there in 138 AD) , but luxury villas have been found in the outskirts of Pompeii too. Goethe and his friends began to recover their spirits as we sat in the pergola of a modest inn looking out over the sea, and ate a frugal meal. The blue sky and the glittering sea enchanted us. There have been many disasters in this world, but few which have given so much delight to posterity, and I have seldom seen anything so interesting. J. W. Goethe. We have a first hand description of what happened in 79 AD thanks to a long letter by Pliny the Younger in which he described the events preceding the death of Pliny the Elder, his uncle. The latter was the admiral of the Roman fleet stationed at Cape Miseno, near Baiae, and he decided to reach the coast at the foot of Mount Vesuvius to better understand what was going on. Once there he discussed with a friend whether it would be most prudent to trust to the houses, which now rocked from side to side with frequent and violent concussions as though shaken from their very foundations; or fly to the open fields, where the calcined stones and cinders, though light indeed, yet fell in large showers, and threatened destruction. In this choice of dangers they resolved for the fields. 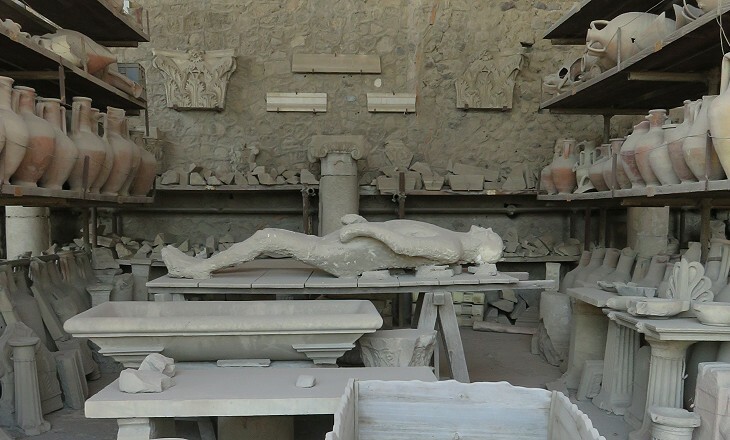 That same choice had been made by the inhabitants of Pompeii: some of those who fled to the sea saved their lives, those who stayed home were eventually buried by the ashes. Archaeologists have made some casts of the dead by injecting plaster in holes found in the solidified ashes which contained bones. This technique was developed in 1863 by Giuseppe Fiorelli, the archaeologist in charge of the excavations. 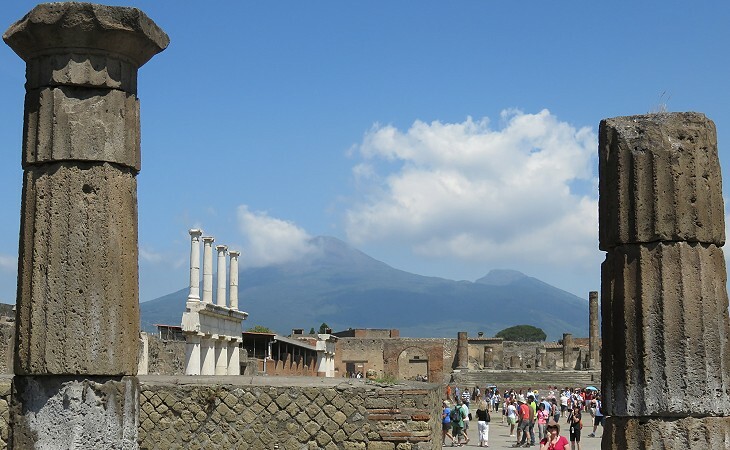 Pompeii was founded on a terrace which provided a natural defence. This was strengthened by ditches and walls along its contour. The town has a roughly elliptical shape, rather than the rectangular one which is typical of those founded by the Romans following the pattern of their military camps. The length of the walls is approximately two miles and the area within the walls is approximately twenty acres. The inhabitants were in the region of 10,000. 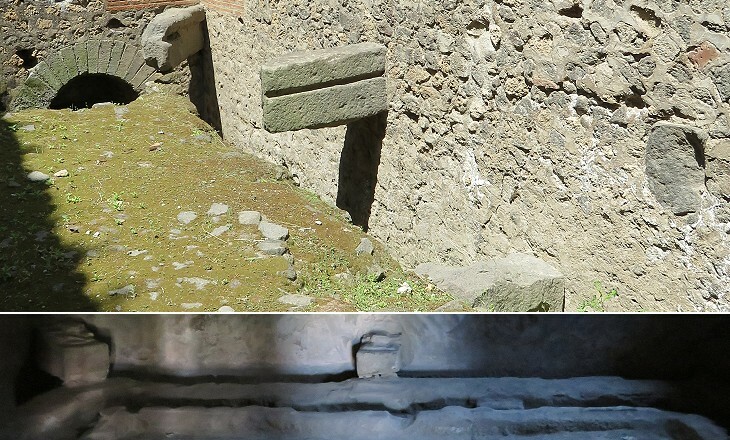 Eight gates have been identified in the walls of Pompeii. 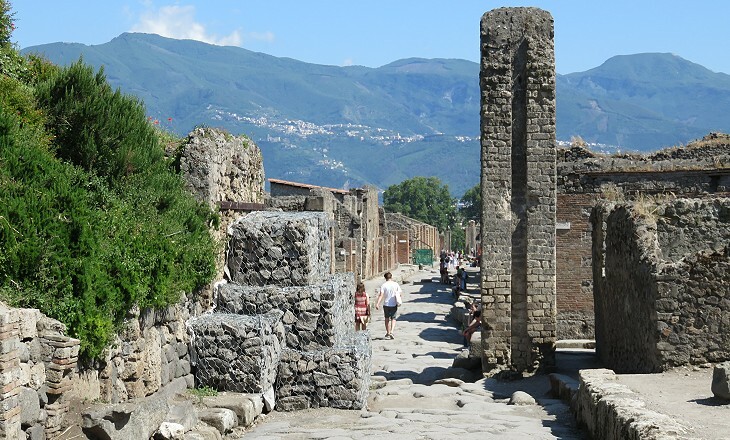 Their names are modern: Porta Marina is the gate closest to the sea, but it did not lead to the harbour, which most likely was linked to Pompeii by a road starting from Porta Stabia. The neighbourhood near this gate was a working-class one made up of modest houses, shops, workshops, and hospitality outlets. 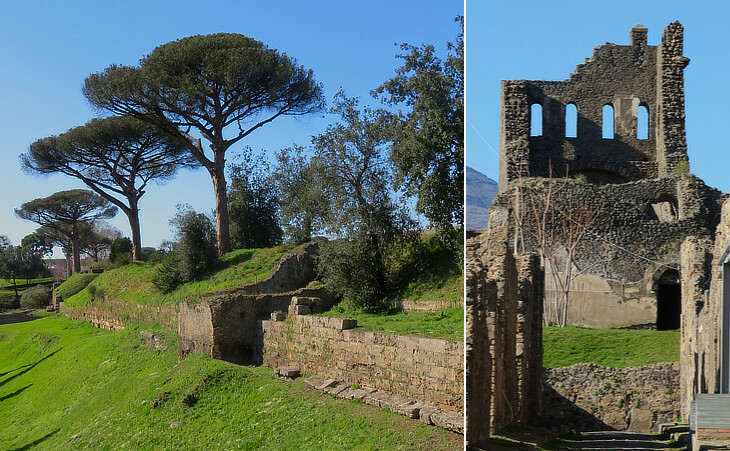 Stabiae (today Castellammare di Stabia) was another ancient town destroyed in 79. Archaeologists have found evidence of several villas built there after the eruption. The urban layout of Pompeii was roughly consistent with the traditional orthogonal grid of Roman towns. This consistency was partly due to the reconstruction of the town after a major earthquake in 62 AD. 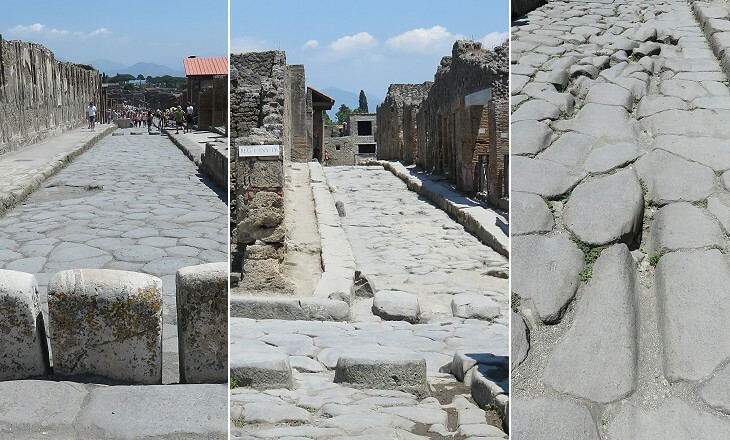 The area near the Forum was rapidly rebuilt, but some poorer neighbourhoods were still in ruin when the ashes covered Pompeii. In 1858 Fiorelli divided the area of the ancient town into nine "regions" and numbered all the insulae (blocks of buildings) they contained, to facilitate their exact identification. The VIth, VIIth and VIIIth "regions" were the first to be excavated and they include the main monuments. The other "regions" are in part still to be excavated or their buildings were destroyed by bombings in 1943. The streets had high pavements with pedestrian crossings. 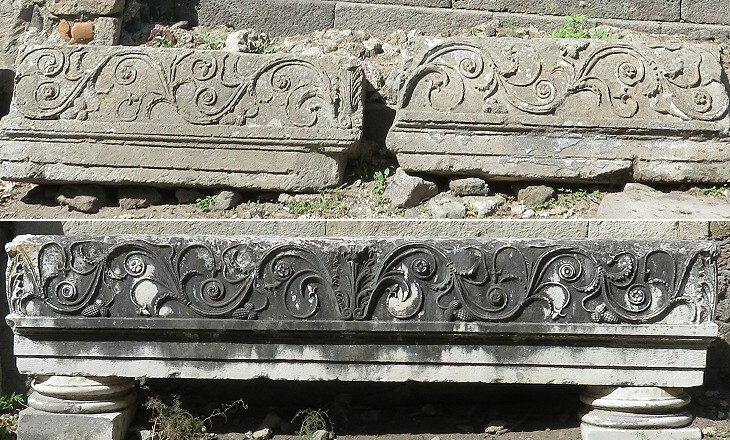 Carriages were prevented from entering the Forum by large upright slabs. Most likely the refuse was carried away daily to the gardens and fields on the backs of donkeys. Pompeii was supplied with water by a branch of an aqueduct built for the city of Naples at the time of Emperor Augustus. Forty public fountains distributed the water throughout the town, but the richest houses had their own fountain in the peristylum, the inner courtyard around which the rooms were arranged. 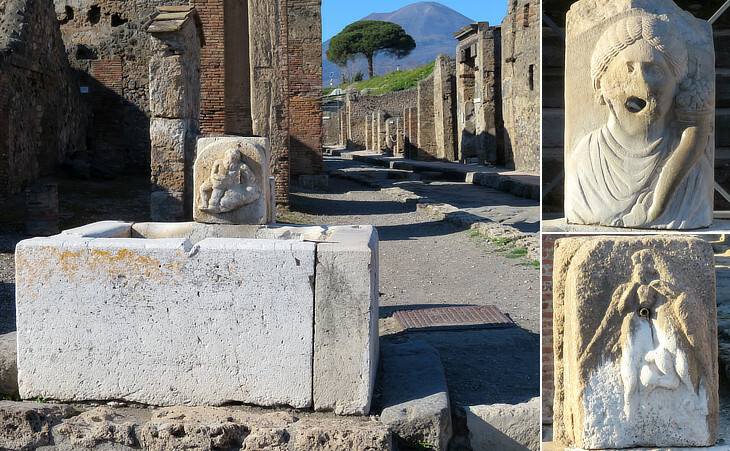 The inhabitants of Pompeii could make use of public facilities located near the Forum or at the baths and most likely near the theatres and the amphitheatre. A special type of public facility was provided by fullones (fullers, cleaners of wool) who made use of (old) urine as a cleaning fluid, because of its ammonia contents. Passers-by were invited to relieve themselves into small jars. 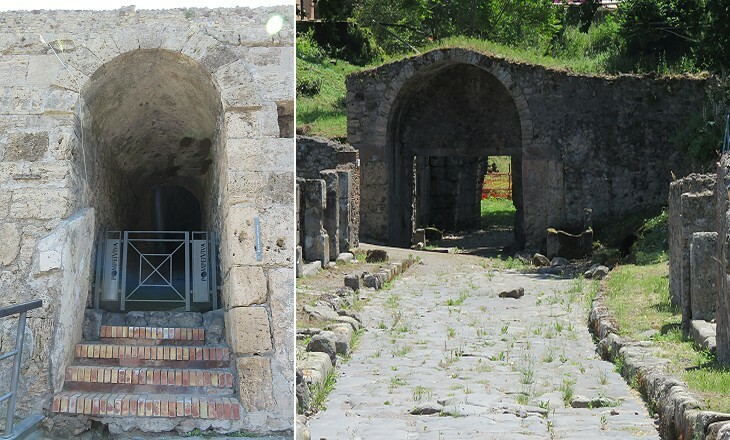 Pompeii complied with the Roman law which did not allow tombs within the walls of the town. 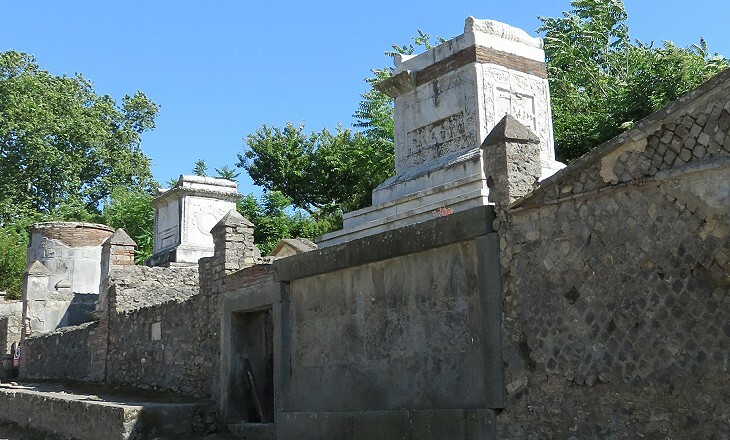 The necropolis found outside Porta Ercolano is the largest one and it retains some fine tombs. 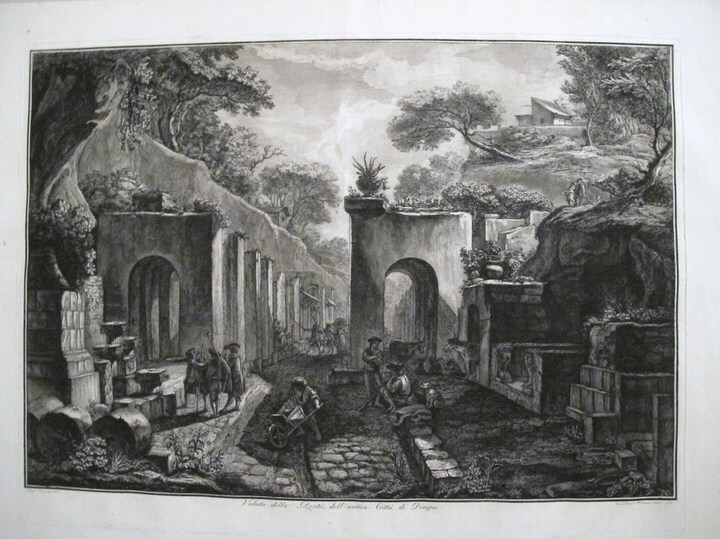 They were made popular across Europe as early as 1789 by etchings by Francesco Piranesi, son of Giovanni Battista (you may wish to see one of them - it opens in another window).